In the midst of thousands and thousands of musicians, artists and bands competing against each other to appeal and stand out to the masses, one name resonates ever so slightly amongst the creative crowd. Kasabian is yet again, not a band that I would devote my entire life listening to. But, due to other people’s trust and conviction in their music, it makes the whole ritual of selecting which artist to try and give a listen to this week, much more at ease. 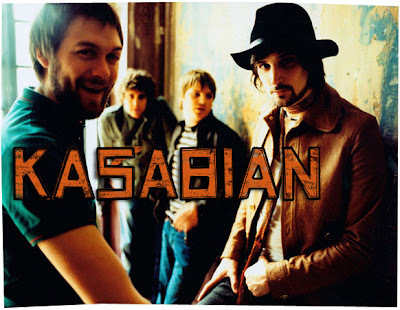 Kasabian is an English rock band that originates from Leicestershire, England, and has often been made comparisons to bands such as Primal Scream, the Stone Roses and Oasis with whom they share the confident swagger and abrasive vocal style of. These cocky U.K rockers are what one may see as the epitome of the English bad-asses particularly for taking no heed of making bold and crude remarks to their other fellow artists, such as My Chemical Romance, Julian Casablancas, Pete Doherty and even the queen of supreme pop, Madonna. Well, whichever way works for them. By now, you can’t help but be curious by the kind of music they manufacture; the band nonetheless has successfully achieved in creating their own music niche, comfortably placed amongst the sounds of vintage Stone Roses and Primal Scream. ‘Me Plus One’ overflows with rough and gritty melodies reminiscent of some place coarse and scorched with heat. The spacious distant sounds of the vocals and the bouncy dissolving ricochets of the guitar all adds up in making this tune one that’s worth listening to over and over.